What is this archive and what might you find there? Dublin City Library and Archives are located in Pearse St., not far from Trinity College Dublin's north-eastern corner. Check their main website for opening hours and details of special exhibitions they host in their entrance lobby. They also play host to talks and society meetings throughout the year so make a note of the location. You need to show proof of Irish residency to be issued with a borrower's ticket but visitors with photo identification can easily obtain a Research Card to gain access to the City Archives reading room ... which you will find replete with snoozing students making the most of the free wi-fi! The reading room has terminals to access the on-line collections (more below) and open shelving on which I found some beautiful original editions of the Treble Almanac of Dublin which according to their website date from 1752 - you won't find these on-line! How to find your way to treasure in this archive, in person or remotely? There is a catalogue on-line, but from the look of it, it is designed to help you borrow any book available throughout the library system in Ireland but you never know what you might turn up through it with some judicious keywords I suppose. If you do visit in person, you can get access to a number of on-line important Irish genealogical resources for free including the Irish Newspaper Archives and the Irish Times Digital Archive, both of which can be pricey to sign up to individually, so make a plan and make the most of these resources if you are on a research trip. 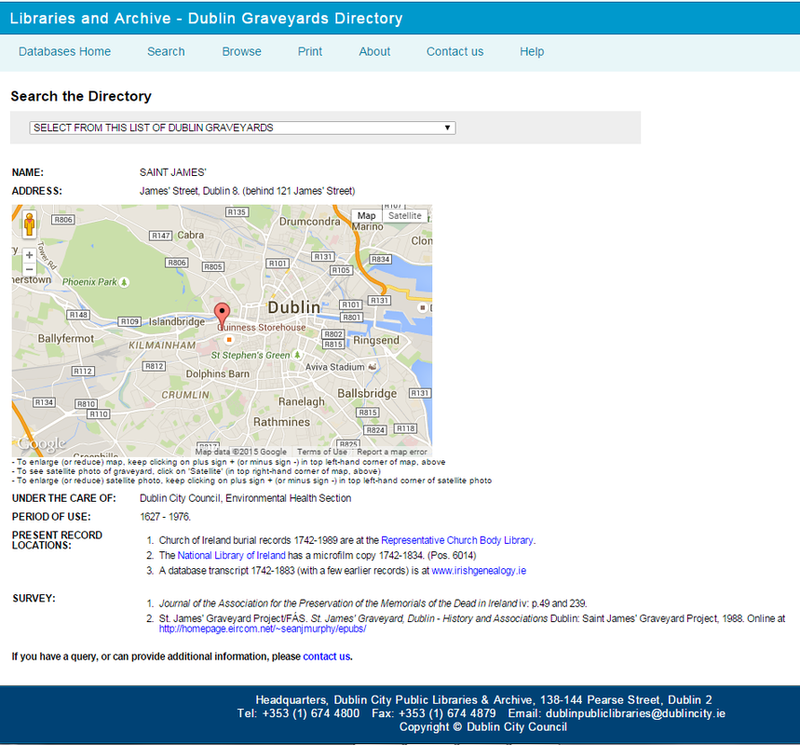 As someone who loves maps, one of my favourite resources is their Dublin Graveyard Directory which not only pinpoints the location of your chosen graveyard on a map, but also gives you information on what records might have survived and where they might be, plus details of any transcripts, articles or books that the burials might appear in - just brilliant! In the following example for St. James' in Dublin, not only are you directed to the burial transcripts that appear on the Irish Genealogy site, but there are also some links to some publications by Sean Murphy which tell you so much more about the graveyard.